Definition at line 76 of file lllocalidhashmap.h. Definition at line 728 of file lllocalidhashmap.h. References LLLocalIDHashMapIter< DATA_TYPE, SIZE >::mHashMapp, NULL, and LLLocalIDHashMapIter< DATA_TYPE, SIZE >::setMap(). Definition at line 735 of file lllocalidhashmap.h. References LLLocalIDHashMapIter< DATA_TYPE, SIZE >::mHashMapp. Definition at line 838 of file lllocalidhashmap.h. References LLLocalIDHashMapIter< DATA_TYPE, SIZE >::mCurHashNodeKey, LLLocalIDHashMapIter< DATA_TYPE, SIZE >::mCurHashNodep, LLLocalIDHashNode< DATA, SIZE >::mData, and LLLocalIDHashMapIter< DATA_TYPE, SIZE >::mNull. Definition at line 792 of file lllocalidhashmap.h. References LLLocalIDHashMapIter< DATA_TYPE, SIZE >::mCurHashMapNodeNum. Definition at line 786 of file lllocalidhashmap.h. References FALSE, LLLocalIDHashMapIter< DATA_TYPE, SIZE >::mCurHashNodep, and TRUE. Definition at line 762 of file lllocalidhashmap.h. References i, LLLocalIDHashMapIter< DATA_TYPE, SIZE >::mCurHashMapNodeNum, LLLocalIDHashMapIter< DATA_TYPE, SIZE >::mCurHashNodeKey, LLLocalIDHashMapIter< DATA_TYPE, SIZE >::mCurHashNodep, LLLocalIDHashMapIter< DATA_TYPE, SIZE >::mHashMapp, and S32. Definition at line 848 of file lllocalidhashmap.h. References i, mCount, LLLocalIDHashMapIter< DATA_TYPE, SIZE >::mCurHashMapNodeNum, LLLocalIDHashMapIter< DATA_TYPE, SIZE >::mCurHashNodeKey, LLLocalIDHashMapIter< DATA_TYPE, SIZE >::mCurHashNodep, LLLocalIDHashMapIter< DATA_TYPE, SIZE >::mHashMapp, LLLocalIDHashNode< DATA, SIZE >::mNextNodep, and S32. Definition at line 90 of file lllocalidhashmap.h. 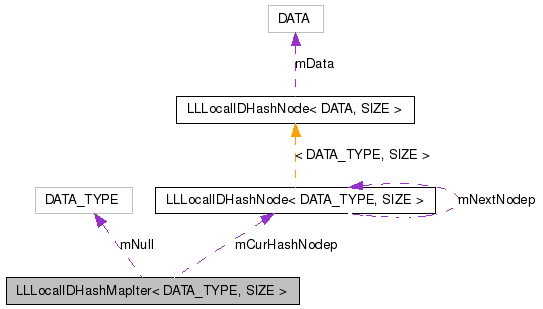 References LLLocalIDHashMapIter< DATA_TYPE, SIZE >::mCurHashNodeKey, LLLocalIDHashMapIter< DATA_TYPE, SIZE >::mCurHashNodep, and LLLocalIDHashNode< DATA, SIZE >::mData. Referenced by LLLocalIDHashMapIter< DATA_TYPE, SIZE >::operator->(). Definition at line 94 of file lllocalidhashmap.h. References LLLocalIDHashMapIter< DATA_TYPE, SIZE >::operator *(). Definition at line 806 of file lllocalidhashmap.h. References i, llclamp(), LLLocalIDHashMapIter< DATA_TYPE, SIZE >::mCurHashMapNodeNum, LLLocalIDHashMapIter< DATA_TYPE, SIZE >::mCurHashNodeKey, LLLocalIDHashMapIter< DATA_TYPE, SIZE >::mCurHashNodep, LLLocalIDHashMapIter< DATA_TYPE, SIZE >::mHashMapp, and S32. Definition at line 744 of file lllocalidhashmap.h. References LLLocalIDHashMapIter< DATA_TYPE, SIZE >::mCurHashMapNodeNum, LLLocalIDHashMapIter< DATA_TYPE, SIZE >::mCurHashNodeKey, LLLocalIDHashMapIter< DATA_TYPE, SIZE >::mCurHashNodep, LLLocalIDHashMapIter< DATA_TYPE, SIZE >::mHashMapp, and NULL. Referenced by LLLocalIDHashMapIter< DATA_TYPE, SIZE >::LLLocalIDHashMapIter(). Definition at line 102 of file lllocalidhashmap.h. Referenced by LLLocalIDHashMapIter< DATA_TYPE, SIZE >::currentBin(), LLLocalIDHashMapIter< DATA_TYPE, SIZE >::first(), LLLocalIDHashMapIter< DATA_TYPE, SIZE >::next(), LLLocalIDHashMap< DATA_TYPE, SIZE >::remove(), LLLocalIDHashMapIter< DATA_TYPE, SIZE >::setBin(), and LLLocalIDHashMapIter< DATA_TYPE, SIZE >::setMap(). Definition at line 103 of file lllocalidhashmap.h. Referenced by LLLocalIDHashMapIter< DATA_TYPE, SIZE >::current(), LLLocalIDHashMap< DATA_TYPE, SIZE >::dumpIter(), LLLocalIDHashMapIter< DATA_TYPE, SIZE >::first(), LLLocalIDHashMapIter< DATA_TYPE, SIZE >::next(), LLLocalIDHashMapIter< DATA_TYPE, SIZE >::operator *(), LLLocalIDHashMap< DATA_TYPE, SIZE >::remove(), LLLocalIDHashMapIter< DATA_TYPE, SIZE >::setBin(), and LLLocalIDHashMapIter< DATA_TYPE, SIZE >::setMap(). Definition at line 100 of file lllocalidhashmap.h. Referenced by LLLocalIDHashMapIter< DATA_TYPE, SIZE >::current(), LLLocalIDHashMapIter< DATA_TYPE, SIZE >::done(), LLLocalIDHashMap< DATA_TYPE, SIZE >::dumpIter(), LLLocalIDHashMapIter< DATA_TYPE, SIZE >::first(), LLLocalIDHashMapIter< DATA_TYPE, SIZE >::next(), LLLocalIDHashMapIter< DATA_TYPE, SIZE >::operator *(), LLLocalIDHashMap< DATA_TYPE, SIZE >::remove(), LLLocalIDHashMapIter< DATA_TYPE, SIZE >::setBin(), and LLLocalIDHashMapIter< DATA_TYPE, SIZE >::setMap(). Definition at line 99 of file lllocalidhashmap.h. Referenced by LLLocalIDHashMapIter< DATA_TYPE, SIZE >::first(), LLLocalIDHashMapIter< DATA_TYPE, SIZE >::LLLocalIDHashMapIter(), LLLocalIDHashMapIter< DATA_TYPE, SIZE >::next(), LLLocalIDHashMapIter< DATA_TYPE, SIZE >::setBin(), LLLocalIDHashMapIter< DATA_TYPE, SIZE >::setMap(), LLLocalIDHashMap< DATA_TYPE, SIZE >::~LLLocalIDHashMap(), and LLLocalIDHashMapIter< DATA_TYPE, SIZE >::~LLLocalIDHashMapIter(). Definition at line 107 of file lllocalidhashmap.h. Definition at line 105 of file lllocalidhashmap.h. Referenced by LLLocalIDHashMapIter< DATA_TYPE, SIZE >::current().